On the first night of Passover, more than 200 families in the Bay area will be sharing some ancient Seder traditions and foods that would be unfamiliar to Jews raised with stories of the four questions and expectations of eating sweet charoset. That’s because the Bay area is the home to the largest enclave of Karaite Jews in the United States. Karaim, a sect with roots that go back to the 8th Century, derives its practices only from what is in the written Torah and not from the Talmud or other rabbinic sources. “We don’t have a Seder plate and many things are not acceptable. There is no vinegar, baking powder, or cheese” during Passover according to Rémy Pessah, of Mountain View. Only foods and practices that are mentioned in the Torah are allowed. Anything fermented or that could ferment is forbidden throughout the holiday. Pessah, a textile artist, often lectures about the Karaites and is a talented cook, freely sharing her expertise and recipes for Egyptian Karaite specialties, including teaching a recent class at Osher Jewish Community Center in Palo Alto that was co-sponsored by JIMENA (Jews Indigenous to the Middle East and North Africa). 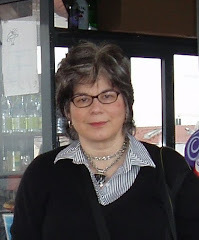 She and her husband, Joe, helped found the Karaite Temple B’nai Israel in Daly City. Karaites celebrate Passover for seven days. They only recount the story of the exodus the first night using Haggadahs featuring details taken from the Torah. Many Karaites in the U.S. feel a very personal connection to the story, since like Pessah’s family they lived in Egypt for centuries, but were forced to emigrate because of deteriorating conditions and persecution (including imprisonment) after the wars with Israel. Other groups of Karaites still live in the Ukraine, Crimea and Israel. Worldwide estimates range from 25,000 to 50,000 with approximately 2,000 living in the Bay area. Karaites’ Passover tables, traditionally dressed in new, white tablecloths, do feature some ceremonial foods. Pessah’s Pesach table in Mountain View will feature two types of matzah – commercially made and a homemade version made with matzah cake meal to eat with the maror. The homemade matzah features coriander seeds. Similar to Sephardic and Mizrahi Jews, Karaites do eat seeds such as coriander and cumin that Ashkenazi rabbinic tradition has made kitniyot or unacceptable. Pessah makes sure the dough is mixed and in the oven in under 10 minutes to avoid any remote chance of fermentation or rising. The maror, or bitter herbs, this special matzah is made for is a chopped salad of greens and herbs including romaine lettuce, chicory and endive. There is no charoset, but whole or chopped nuts are served. 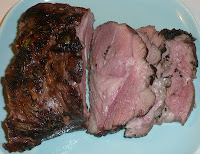 A Karaite Seder meal always features lamb that is roast, barbecued or grilled, according to Pessah. “The Torah says to have lamb when they left Egypt and that the leftovers be burnt and not taken,” she said. “Growing up my mother made sure we have just enough so not to waste.” Pessah says some families roast a whole lamb in recognition of the Temple sacrifice, a practice which is avoided in other Jewish traditions, even those which permit eating lamb at the Seder meal. The Seder meal will also often feature greens and rice but only fresh beans such as fava. “We don’t eat dried beans, we don’t eat anything that has been dried and needs to soak since it will expand,” Pessah explained. Dessert might a jam-filled Swiss roll, but with homemade preserves, since Karaites shun most commercially made Pesach products. Almond brittle, almond cookies and other pastries are also served. Below are several of Pessah’s recipes along with my interpretations of some of the Karaite specialties. 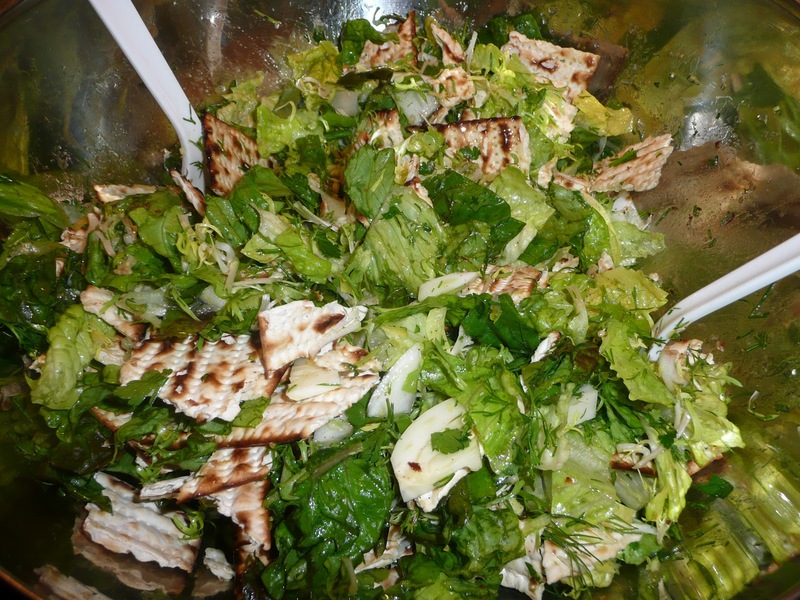 The ingredients in Remy Pessah’s maror inspired this recipe, which was also influenced by Middle Eastern fattoush or bread salads. Fennel fronds are the feathery leaves attached to the fennel bulb stalks. In a very large bowl, combine fennel bulbs, fennel fronds, endive, romaine lettuce, red leaf lettuce, frisee, parsley and dill. Toss well. Cut away the peel and white pith from the two lemons and chop the remaining flesh into 1/4" pieces. Combine chopped lemon pieces in a jar or other container with the lemon zest, garlic, cayenne pepper, black pepper, salt, lemon juice, oil and water. Just before serving, mix or shake the dressing until combined, pour over salad. Toss salad. Add matzah pieces and toss again. Serve immediately. Rémy Pessah’s Maror – To use as a Karaite-style maror, finely chop vegetables and herbs and combine with 2Tbs. lemon juice, 1 tsp. salt and 2 diced pickled lemons. If pickled lemons are not available, use 1/4 tsp. additional salt, 1/8 tsp. cayenne pepper and 2 Tbs. finely minced lemon zest and the finely diced flesh of 2 small peeled lemons. 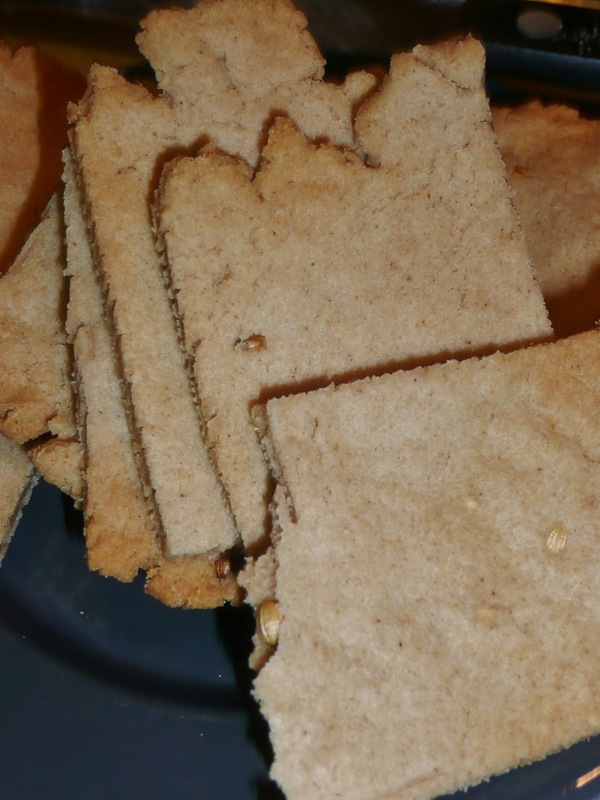 Pessah’s matzah recipe includes coriander seeds, which Ashkenazi Jews avoid during Passover. 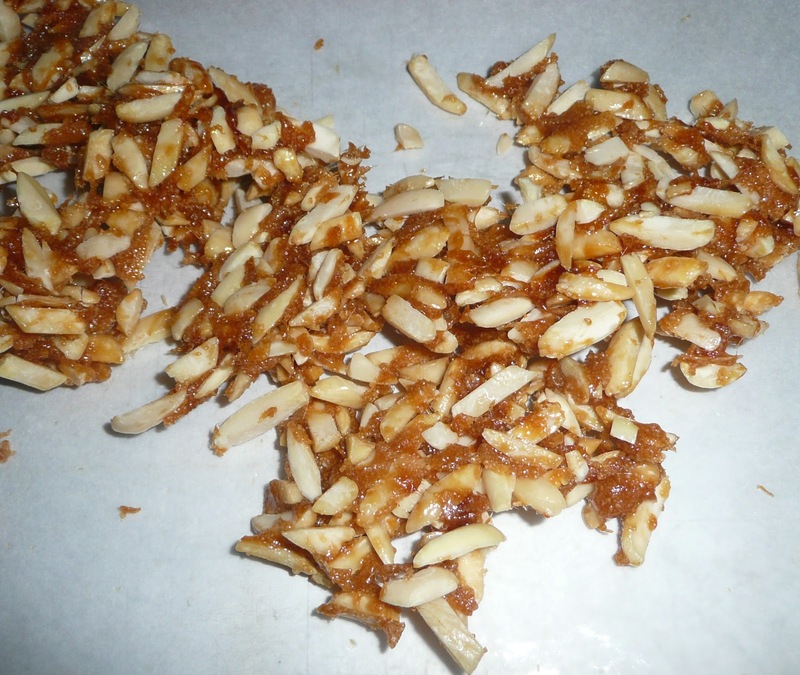 If it is not your custom to eat the seeds during Pesach, just omit them, the crackers will still be very tasty and make a good accompaniment for foods throughout the holiday. Pessah specifies that the dough should be prepared and put in the oven within 10 minutes of mixing the dry ingredients with the wet. Preheat oven to 400 degrees. Combine cake meal, oil, water, coriander seeds (if using) and salt in large bowl. Stir with spoon until all liquid has been incorporated and a crumbly dough has formed. Oil hands and mix until dough combines. Knead for a minute or two until dough is smooth. Divide into 2 equal parts. Form into two disks. Take one disk and then flatten out evenly with fingers on an ungreased baking sheet until the dough is only about 1/8” thick. Repeat on a second ungreased baking sheet with the remaining dough. Cut the dough into 2” x 2” squares. Bake 20-25 minutes until the ends of the dough are slightly brown and the matzah is cooked all the way through. Let cool and store in an airtight container. Having grilled or barbecued lamb for the Seder meal is an important part of the Karaite tradition. Ashkenazi custom is to avoid lamb and roasted meats at the Seder meal. Sephardic and Mizrahi custom includes eating lamb as part of the meal. Trim excess fat off lamb. Combine juice, oil, cinnamon, salt, pepper, mint, garlic and mix well. Open the leg so it lies flat. Rub mixture all over lamb. Let marinate for 1 hour at room temperature or for several hours in the refrigerator, bringing back to room temperature before grilling. Oil grill rack. Prepare charcoal or preheat gas grill to medium high heat. Grill over medium to medium high heat, adjusting for flare ups and turning frequently for 25-35 minutes until an instant-read thermometer indicates desired doneness – 120 degrees for rare, 130 degrees for medium rare, 140 degrees for medium or 155 degrees for medium well. (Thinner sections of the butterflied leg will be more well done than the thicker portion). Meat will continue cooking after removed from grill. Let rest loosely covered with aluminum foil 10-15 minutes before slicing and serving. Place parchment paper on baking sheet. Lightly oil Melt sugar on low heat in a stainless steel pot. Add almonds, stir well. Pour onto prepared baking sheet, spread into a single layer with the back of a large, oiled spoon. Let cool and break into sections. Cook sugar until caramelized before adding the almonds?